Archaeological-focused tours for the curious to the connoisseur. 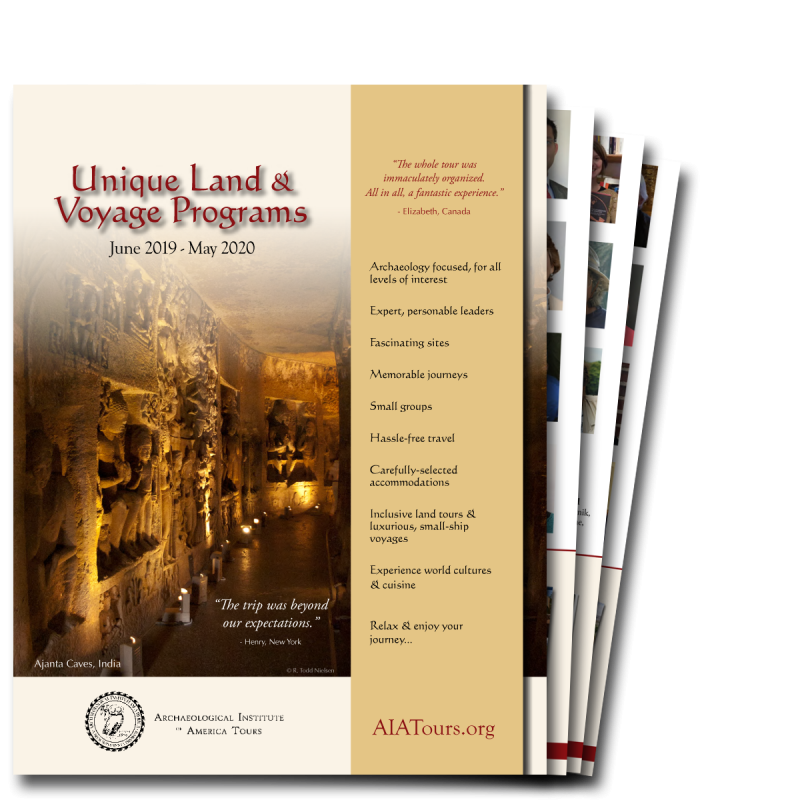 AIA Tours are not designed for professional archaeologists, but for inquisitive travelers wishing to learn from experts who are chosen for both their knowledge and ability to deliver lively and informative talks. AIA travelers enjoy learning firsthand about cultural history by viewing splendid archaeological sites, art, architecture, and museum collections. AIA travelers often find themselves in special meetings with local archaeologists and other professionals, taking behind-the-scenes tours, attending dance and musical performances, and browsing in galleries and local markets. AIA Tours offers distinctive land-based trips, including a few easy to moderate hiking adventures, as well as cruises aboard small, elegant ships. On our land-based trips, the average group comprises just 15 travelers. At each carefully-chosen hotel we avoid one-night stays whenever possible, instead staying two to four nights, for a trip pace that allows ample time to explore and absorb. Our accommodations provide comfort, charm, and proximity (wherever possible) to the important sites. Cruises are aboard comfortable to luxurious small, yacht-like vessels with between 25 and 122 cabins; or aboard a lovely, 386-guest, mid-sized ship. Unpack once and travel with ease, docking in the heart of smaller, historic ports, close to each extraordinary site. On land-based trips AND on cruises, expert trip managers handle all of the logistics, and professional local guides accompany all excursions, smoothing the way so that you can relax, learn, and enjoy the journey. All or most excursions and meals are included, as are many or most gratuities to staff you encounter along the way. Full details for all AIA Tours are on this website, or you can call 800-748-6262 or email us at aia@studytours.org and we will send you detailed brochures as soon as they are available. Also ask to receive our monthly e-newsletter that provides the latest information on destinations and special offers! Don't forget to follow us on Facebook.